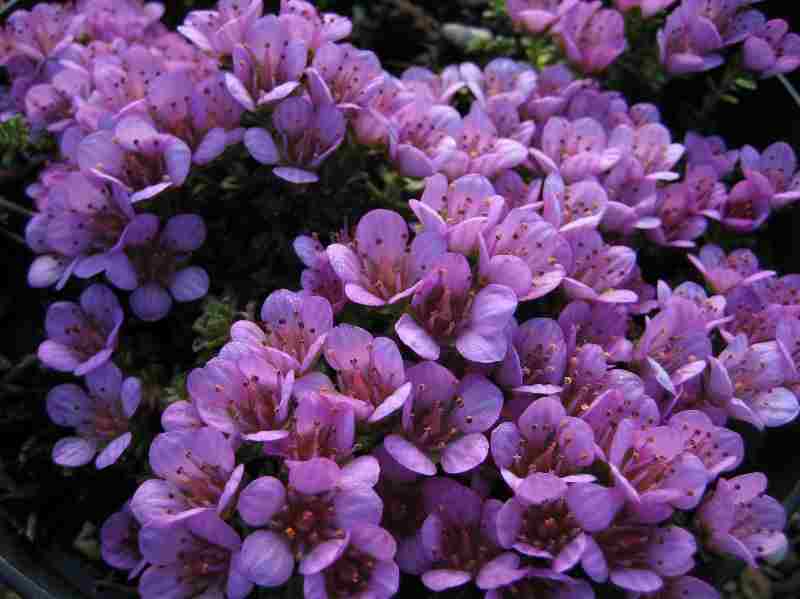 In this section we hope to offer some advice on growing alpine plants. We are happy to offer advice to prospective customers so long as they realise that our time is limited and any advice is only offered in good faith. It's impossible for us to give any guarantee that any plant recommended will be suitable for your particular conditions. We will be adding more information to this section and throughout the site to aid customers. If you would like us to help select plants for you, we offer a good range of Plant Collections and most of these can be tailored to meet your specific requirements. We make every collection to suit and are very flexible about what we can include. 1. 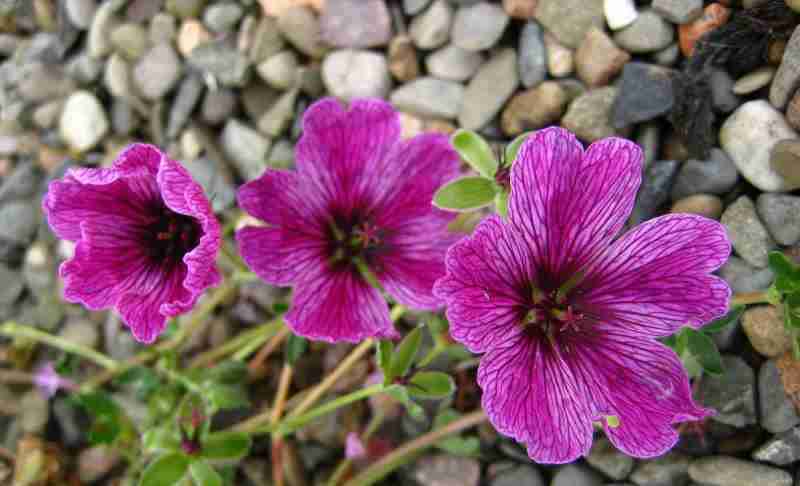 Hints, tips and advice on growing alpine plants. As the title says, but aimed at those who are new or relatively new to the wonderful world of growing alpine plants. What exactly is an alpine plant? How to use alpines in your garden. That is a good question and not so easy to answer. There is no definitive description but basically it is a plant which grows in alpine regions of the world, i.e., at elevation, on or around mountains. To withstand the conditions found in such regions - cold, wind, snow cover etc., the plants have become adapted to suit their environment. Typically, they are slow-growing, long-lived, short in stature and may have small, hard or downy leaves to resist the cold. Many have a short but abundant flowering period as typified by this picture of Saxifraga oppositifolia which can even be found growing on the mountains of Britain. The plants might be snow-covered for long periods then have to contend with copious amounts of water as the snows melt. The soil is typically stony and very free-draining and the plant's roots might have to search deeply for nourishment especially in the 'scree' area where gravel and stones have fallen and accumulated. So an alpine is a mountain plant? Well, mostly, but not always, as some beautiful alpines grow on cliffs by the sea, such as our native Sea Thrift or armeria like this Armeria maritima 'Dusseldorfer Stolz' seen here growing happily in a large pot. Other alpines may even grow right on the beach among the shingle - hardly a mountain plant! And yet, the plants still have to endure a harsh environment, especially wind, and the beach could be in Alaska or other cold place but the plants survive in their stony surroundings. Some prefer the term 'rock plant' as many alpines associate so well with rocks and stones. 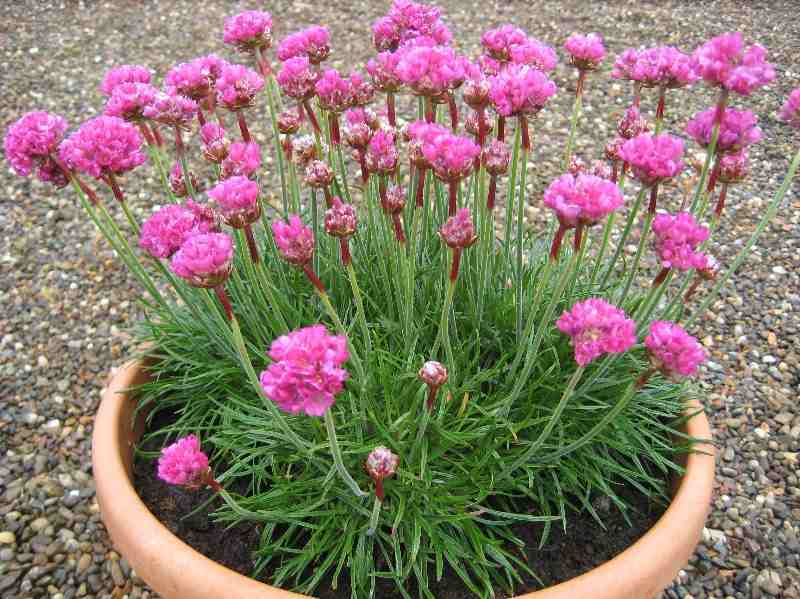 It still amazes me that when planting alpines in the garden or in a container how much better they look (and perform) with layer of small gravel is spread around the plants - it would have made this pot of Thrift look better too! native Celandine often seen around wood edges and along hedge bottoms in spring. As we get more and more confused about what makes an alpine, in much of Europe the equivalent of alpine or rock plant doesn't even exist - they are simply low-growing perennials. Well, the obvious answer would be, "On your rock garden", but not many people can afford or have space for such a feature. Many more people have a 'rockery' - a mounded or sloping area with a few stones dotted about - and alpines can thrive here - but they are by no means essential. Many alpines look stunning planted in an old stone sink or trough (again, it's the association with stone) but the same effect can be had with artificial stone replicas. Some are even made from polystyrene so weigh very little and could even be placed on a balcony. You don't even need a garden as such to grow and enjoy alpines. A group of any type of containers, stone, plastic or whatever planted with alpines will make a charming feature and be attractive in all seasons. Continuing the stone association, many of the low, spreading alpines look good when planted near paving, their natural, informal shapes relieving the hard feature of paving slabs. Likewise in and around gravel areas where the gravel mimics the plants domain in nature, such as the Geranium 'Laurence Flatman' seen here sprawling over a gravel path and softening those hard edges. You must have seen the (usually purple) aubretia hanging from walls in the spring - an alpine type plant being used in a situation that mimics nature. Many alpines will spread and cover walls as long as their roots can reach the soil within or behind the structure. A quick word about drainage - we often use the terms 'free-draining', 'needs good drainage', etc. What does this mean? All it means is that water cannot rest around the plant or its roots. If one thing most alpines do not like it is water around them - any excess must drain away quickly. This is helped by having (or making) a gritty or sandy soil and by placing grit or small gravel around (and under the leaves) of the plants. If you have read from the top of this page you will now know that alpines are a very varied lot, but for the majority, their requirements are a sunny site not overhung by trees, a fairly 'poor' soil in so far as not being well fed or manured and if the soil is slightly sandy or gritty (or can made so) then so much the better. Such condtions will satisfy a huge range of diverse and interesting plants providing lasting colour, shape and interest all year - and for years to come. There are two major clubs in the UK (and world-wide) for alpine plants - one is the Alpine Garden Society (AGS), the other, the Scottish Rock Garden Club (SRGC). Each of their websites is well worth a look. The SRGC also has an online forum - someone on there knows the answer to your question, they are very helpful and friendly and beginners are welcomed. The Royal Horticultural Society also has an excellent website, packed full of useful and interesting information. One book I would recommend is, 'Alpines: An Essential Guide' by Michael Mitchell (Crowood Press). Written by an experienced alpine grower and nurseryman, it covers just about every question you might have about alpines and how to grow them. Our online Plant Shop offers a huge range of plants for you to choose from and gives some guidance on what conditions many of the plants prefer. If you can't decide what to order, or are unsure if you are selecting the best plants, then our special Collections are a simple solution and ideal for the beginner or someone needing to fill a large area at reduced cost. It is largely true that most alpine and rockery plants prefer a sunny site but not in every case. Some plants will undoubtedly do better in a sunny site but that same plant might do well enough in a lightly shaded site. It all depends on the depth of shade (how dark it is) and the duration of shade. A site might get a couple of hours of sunshine in the mornings or evenings or it might get no direct sun at all but some dappled shade (and light) from a nearby tree. If your site gets some direct sunshine at some time during the day, then you can choose from the list below. Plants can be very adaptable - even true sun-lovers like some Sedums will do well enough in light shade. Another factor you must consider is the how dry the site is - dry shade, especially where nearby trees block light and draw moisture is especially difficult but not impossible if you water plants until they properly establish. Alpine and rockery plants for a hot, dry, sunny site. Now we're talking! A much wider range of alpines and rockery plants will thrive in these conditions, not merely survive. The plants listed in bold will survive the hottest and driest conditions best of all. Many other plants would do well in these conditions too, especially if their roots can penetrate deeply to find moisture or you can water them occasionally during drought. Alpines suitable for troughs and containers. We grow a very wide range of plants which are truly suitable for growing in troughs. If you are a novice you probably couldn't do better than with one of our specially selected trough plant collections. Other containers are equally suitable but we simply refer to them as 'troughs' or 'plants for troughs'. A web search for 'planting alpine troughs' or similar will yield a bounty of (generally) good advice. I list some links below that are worth reading and offer honest, reliable advice. I will add a few basic tips - all containers must have drainage holes in the base. Use a good, soil-based compost. Yes, you can grow perfectly good plants in a the more common peat-based composts (or even peat substitutes) but it's my opinion that nothing will ensure better chances of long-term success than incorporating some soil (or loam) in the compost. A good basic recipe is to select a John Innes compost (from any garden centre or diy store) and mix in a good amount of small grit - perhaps 1 part grit to 3 parts of pre-prepared John Innes. This will improve drainage but it will also make the container very heavy, so first place the container where it is to stay. Another tip is to fill the container to the brim with compost mixture, even overfill it, mounding it slightly as you plant. Nothing looks worse than a loosely filled container where the compost (and plants) have settled a few inches below the rim of the container - it just looks wrong! Firm the compost around the edges as you fill the container. A carefully selected and placed stone or two often looks good as can broken slate arranged almost vertically or sloped at an angle. These offer different planting opportunities for some of the little gems. After you have planted your trough, top it off with generous layer of grit or small gravel. Feeding. The initial compost will contain enough nutrients to last the plants for the first season. Thereafter, only a light sprinkling of powdered fertiliser should be needed, once in spring and again in late June/July. Only use at half the rate recommended for other garden plants. A fertiliser containing more potash - high 'K' or fruit and flower feed - is ideal. Liquid feeding works well too - a liquid tomato fertiliser is ideal, but again, only at half-rate. This can be given perhaps every 3 or 4 weeks or so when watering during the growing season. The aim is just to keep the plants healthy and active in their limited volume of soil, not to encourage lush, rapid growth - hence the use of fertilisers at low rate only. When compliling this list I have restricted it to those smaller, neater-growing alpines that will enjoy growing in a stone trough or similar container. Androsace - all of them. A. sempervivoides will form a mat and mound itself over an edge. The rest are more or less bun-shaped. Armeria juniperifolia (pink) and 'Alba' (white), 'A Little in the Red'. Aubrieta 'Astolat' - a neater and slower growing form with silver variegated foliage. Campanula - smaller ones like 'Elizabeth Oliver', Timsbury Perfection', 'Tubby' and 'Puck'. Delosperma - congestum and sutherlandii. Succulents enjoying hot, sunny places. Dianthus - many, especially D. alpinus, Joan's Blood, Babi Lom, Berlin Snow, Inshriach Dazzler, La Bourboule Alba. Ectotropis - a succulent (formerly Delosperma 'Sani Pass'), good, dark foliage and white flowers. Gentiana saxosa - a classy late summer Gentian with white flowers. Evergreen. Globularia 'Blue Bonnets' - neat evergreen buns, pretty blue globe flowers. Lewisia - all. 'Little Plum' is highly recommended but all are good for troughs. Morisia monanthos - when we have it! Oxalis 'Ione Hecker' and 'Waverley Hybrid'. Superb trough plants. Neat and 'different'. Potentilla nitida Rubra - classy solver-leafed plant and unusaul rosy pink flowers. Primula - all the dwarf ones, 'Mrs J H Wilson', 'Dianne', P. marginata 'Prichard's Variety', P. warshenewskiana and others. Salix - esp. 'Boydii' - a shrub, but very slow and Salix reticulata. Saponaria 'Bressingham' and Saponaria x olivana. Saxifraga - almost all, especially silver encrusted, Sax. oppositifolias and the early flowerers like 'Boston Spa' and 'Gold Dust'. Sedum - almost all but esp. the smaller types. Good if hot and dry. Sempervivum - every one of them. As above, good if hot and dry. Thymus 'Elfin', possibly 'Minor' if more space. Several people have given their time freely to encourage and educate others on making troughs and growing alpine plants. Gardening people are some of the most generous people around, happily giving their time, knowledge (and often plants!) free for the benefit of others. Here are a few of the best sites I have come across, in no particular order. Jan Tholhuijsen has made a remarkably informative video and e-book explaining how he makes his own troughs - from polystyrene boxes, but you would never guess!. It's well worth reading and a rich source of additional information - and inspiration! Thank you, Jan. Portraits of Alpine Plants is another wonderful website from a very experienced grower of alpine plants. Everything is covered - buying or making your own 'stone' sink (various methods), choosing plants, siting, compost - it's a very good read. Although the site is some years old, the author's knowledge and enthusiasm for plants is peerless. Growing with Plants is a useful read and has lots of good photo's to help you along the way. One minor word of caution - it is American, so some of the references may be lost on us and it's written in a very informal style (not a criticism). The Scottish Rock Garden Club forum has a specific topic on troughs with some amazing images for inspiration and some useful tips. It is fairly lengthy. Several of the plants we offer have silver or grey leaves and nothing looks better in the sunshine. Silver is also the ideal neutral backdrop to all those colourful flowers. Most prefer a well-drained and sunny position. Saxifraga - many - cochlearis Minor, Silver Maid, Monarch, Whitehill, Doctor Clay, Frances Cade and others. Coastal gardens bring their own challenges - wind, salt and usually poor, sandy soils. Fortunately, many alpine plants will not only survive in these conditions but thrive in them. Most alpine plants are naturally low-growing and their low, spreading growth means they are less troubled by wind. Similarly, free-draining, sandy soils will suit many alpines perfectly - indeed, many alpines are thoroughly drought-tolerant, more so than most plants. Salt picked up from the sea and carried by the wind brings a particular problem - it will scorch (or brown) leaves and can kill plants stone dead. But here again, alpines are your friends because they have different means of lessening any damage. Some have thick waxy coatings on their leaves (like most of the Sedums) that reduces any damage or have very small leaves. Other alpine or rockery plants are herbaceous - the top leaves of the plant die back for winter (avoiding the worst storms) and regrow afresh in spring. And some plants are naturally adapted over thousands of years to grow and thrive right on the beach or on the rocks. Armeria maritima (maritima, of the sea) is the classic example, our native Thrift that can be found on practically every shore of the U.K. Your selection of suitable plants will be determined by the severity of your garden's exposure - if it really is 'right by the seaside' then you will need to choose more carefully and, possibly, be prepared for some trial and error and disappointments along the way. However, the merest bit of shelter can extend your selection - perhaps a wall or fence, or some wind-pruned shrubs will offer just enough protection to make growing beautiful plants possible. If you are near the sea rather than immediately on the beach then you have many more options of plants. A final word on soil - if it is almost pure sand it will be best to improve that by adding organic matter. Garden compost, well-rotted manure, used growbags or any of the peat substitutes will do the job of retaining moisture. Just be careful not to improve the soil too much! 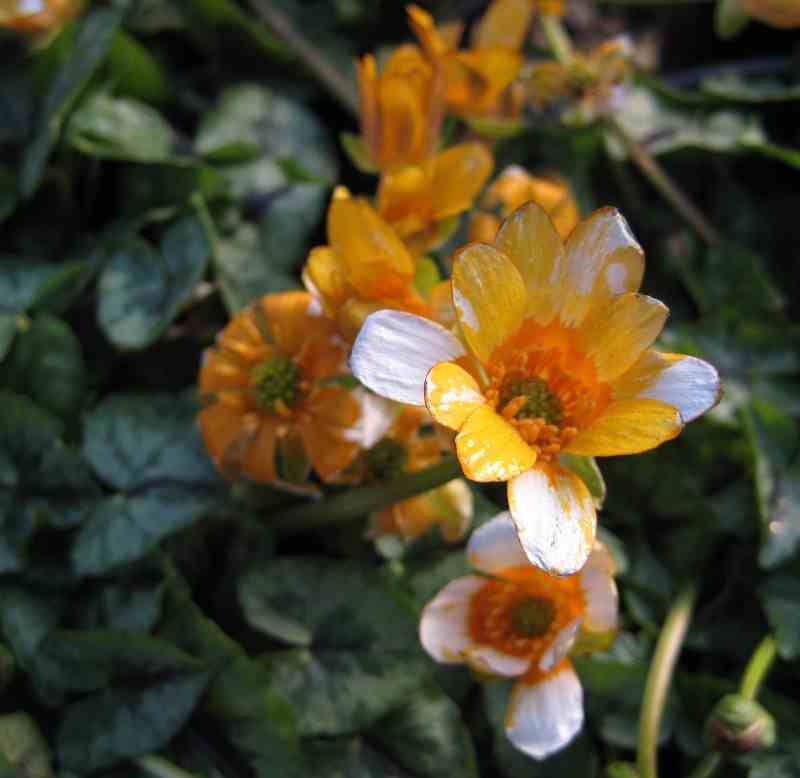 Alpines dislike rich soil, full of nutrients, so don't go mad. Soil improvement isn't absolutely essential - remember many alpines are naturally drought resistant - but it can increase the range of plants you can grow. Many, many alpines will do well if you can get them established through their first full year. Armeria - all will do well. Campanula - most die back (or nearly so) in winter. Helianthemum - will regrow in spring if winter damaged. Sedum - all of them. Sempervivum - especially those with small rosettes. Thymus - the thymes are evergreen but the small creeping ones (T. serpyllum Pink Chintz, Purple Beauty etc.) can take some abuse. Veronica prostrata - and varieties. We also offer a range of different plant collections which we can make up to your requirements.